The SPEC community mourns the passing of Dr. Reinhold Weicker. He died peacefully on March 23, 2018, surrounded by family. 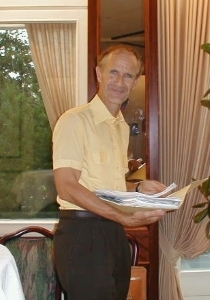 Reinhold was the author in 1984 of the Dhrystone benchmark, the first portable program representing a broad range of real-world applications. Dhrystone was designed based on programming language features across applications in FORTRAN, PL/1, SAL, Algol 68, and Pascal. Its simplicity and widespread availability led to a rapid accumulation of test results across many different computer systems. Its principles — portability, transparency, availability of code for reproducibility, and a large results base for comparability — became founding principles of SPEC. The small size of Dhrystone, Reinhold realized, was an asset for porting ease, but a weakness for uncharacteristic compiler optimizations. He saw the need for a benchmark that was both portable and broadly representative of the marketplace, but knew this would require more resources than any single company could contribute. He joined SPEC representing Siemens-Nixdorf Computer to add his performance expertise to SPEC's benchmark projects. Reinhold was always on guard against benchmark-specific optimizations. He helped craft technical barriers to performance results that didn't represent real users' experience and helped establish run rules prohibiting actions that might overstep those barriers. In this and other areas, Reinhold became the "conscience of SPEC". After he retired from SPEC, member representatives often resolved rule disputes by asking one another: "What would Reinhold do?" Reinhold helped SPEC become an international organization, encouraging European organizations to join benchmarking efforts and paving the way for new members from Asia. His work in advocating worldwide technical symposia and information exchange brought greater numbers of universities into SPEC, setting the stage for the SPEC Research Group and events such as the ACM/SPEC International Conference on Performance Engineering (ICPE). Working with Reinhold was a pleasure. He helped set the foundation for the camaraderie, objectivity and dedication to industry service that makes SPEC such a great organization. SPEC misses Dr. Reinhold Weicker, but his spirit still guides us.